The first-generation Corvette was originally designed as a show car for the 1953 GM Motorama display at the New York Auto Show. It was so well-received by the public, that GM began production on June 30, 1953 of the hand-built model for the 1953 model year. 300 1953 Corvettes sporting Polo White paint with a bright red interior were built that year. 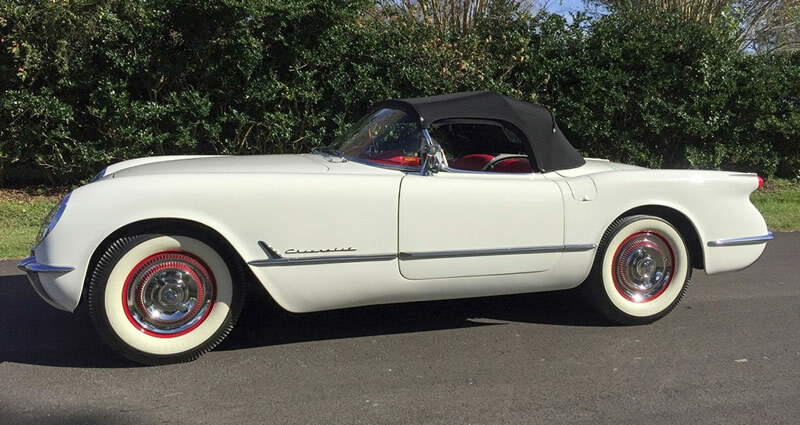 This particular 1953 Corvette will be up for auction by Barrett-Jackson (Lot #1359) in Scottsdale, Arizona with No Reserve. Why is this one special? This particular 1953 Corvette happens to be Number 300 of 300. It has a very well-documented history and is well-known in the Corvette community, as it maintains its all-original body panels, trim parts, chassis and drivetrain components. Jim Fasnacht, the current owner, purchased #300 in 1998 from long-time owner and well-known Corvette enthusiast Ernie Hendry of Florida. When the paint on the car began to lightly “craze” in 2007, Bloomington Gold/NCRS Master Judge Steve Newsom of Texas was enlisted to refurbish the paint – and ended up doing a full frame-off restoration to exacting standards, with the top and interior restored by specialist John Kennedy. The car comes with its mint original side windows, factory jack, manuals, an assortment of historic records and a new-in-the-box original (never activated) tar-top battery. previous Is GM Planning an Electric Corvette?